COOL. A song by Louis P. Burns aka Lugh © 1990. By Louis P. Burns aka Lugh © 1990. Upstate Renegade Productions © 2000 ~ 2006. All Rights Reserved. In the arms of my love. Some people don't understand me. Some people say I'm a fool. Some people don't understand us. Many people say that we're fools. and sew the seeds of our dreams. I know you think I'm a fool. Click here to listen to the Jazz version of my song; Cool (performed by Terence Morrison and The Gay McIntyre Quartet). Written and produced by Louis P. Burns aka Lugh © 1990. Upstate Renegade Productions ©2001. All Rights Reserved. This version appears on the Wishing Well - Derry Artist's & Musician's CD for Foyle Hospice in Derry, Northern Ireland (more soon) which I produced with the very kind engineering skills of Ian Bell (Multimedia Department) at the North West Institute of Further and Higher Education (NWIFHE) back in 2001. The CD was produced with the brilliant sponsorship-in-kind of all major media sources servicing the Derry / Londonderry / North West of Ireland plus financial sponsorship from some of the North West of Ireland's Business community. Wishing Well was produced in memory of a great actor, good friend and workmate within activist drama, music and performance arts; Stephen Connelly. Click here to listen to the Jazz version of my song; Cool (performed by Aisling Doherty and The Gay McIntyre Quartet). This version also appeared on the same CD along with 10 songs by other influential, local and talented musicians singer/songwriters. The CD's cover, back cover and on-body art came as superb contributions from some of Derry's finest artists, photographers and poets. Re: COOL. A song by Louis P. Burns aka Lugh © 1990 / 2001. Click here to listen to: COOL By Louis P. Burns aka Lugh © 1990 / 2001 (Jazz version featuring Terrance Morrisson and the Gay McIntyre Jazz Quartet for Wishing Well CD) © Louis P. Burns aka Lugh / Upstate Renegade Productions 2000 / 2001. All rights reserved. 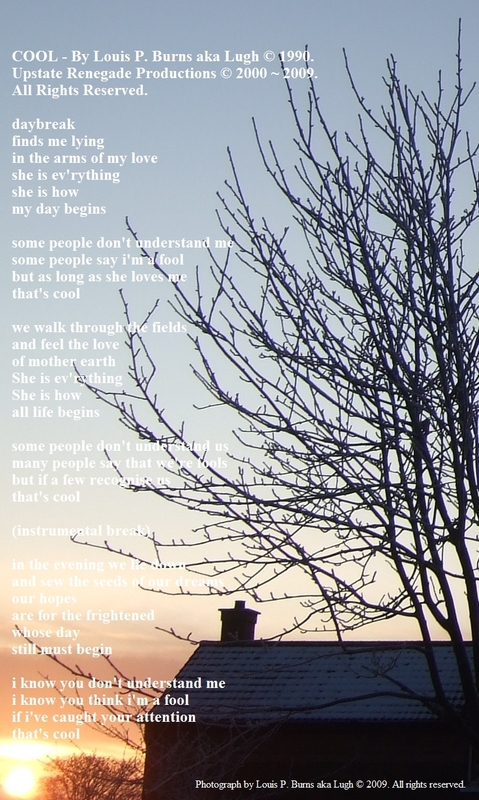 Embedded text (lyrics) and photograph by Louis P. Burns aka Lugh ©. All rights reserved.